China's far-reaching, anti-ship ballistic missile the DF-26 has been mobilized to Northwest China's plateau and desert areas, reported China's national broadcaster on Tuesday after a US warship trespassed into China's territorial waters off the Xisha Islands in the South China Sea on Monday. The DF-26 is China's new generation of intermediate-range ballistic missile capable of targeting medium and large ships at sea. It can carry both conventional and nuclear warheads. The DF-26 is attached to a brigade under the People's Liberation Army (PLA) Rocket Force that operates in Northwest China's plateau and desert areas, China Central Television (CCTV) reported. The report said the missiles are now capable of mobile operations across the country. It was unclear from the CCTV report when the missiles were mobilized. A mobile missile launch from deep in the country's interior is more difficult to intercept, a Beijing-based military expert, who asked not to be named, told the Global Times on Wednesday. During the initial phase of a ballistic missile launch, the missile is relatively slow and not difficult to detect, making it an easier target for enemy anti-missile installations, the expert noted. After the missile enters a later stage, its speed is so high that chances for interception are significantly lower, the expert said. This is also the first time the missile has made a close-up public appearance since it came into service with the PLA, cctv.com reported. The timing of the report sparked discussions among Chinese military observers online, as it came after the USS McCambell, a US guided missile destroyer, trespassed into China's territorial waters off the Xisha Islands on Monday without permission from the Chinese government. China dispatched aircraft and warships to warn the US vessel and has lodged a solemn representation with the US, Foreign Ministry Spokesperson Lu Kang said at a daily briefing on Monday. The report is a good reminder that China is capable of safeguarding its territory, the anonymous expert said. 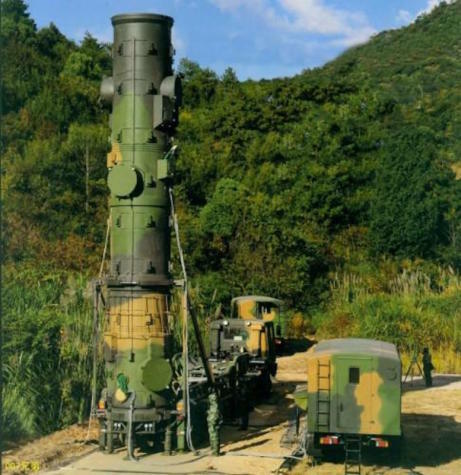 "Even when launched from deeper inland areas of China, the DF-26 has a range far-reaching enough to cover the South China Sea." It can hit targets 4,500 kilometers away, china.com reported, making it capable of striking targets including US naval bases in Guam in the western Pacific. In April 2018, Ministry of National Defense announced that the missile has officially joined the PLA Rocket Force.